This was the tipping point. This was climate science’s Battle of Hastings, when political exigencies – the enemies of science – broke through the lines and went on to overrun all its institutions. Before Hansen there had always been the rogue scientists hawking some kind of scary scenario to the press or politicians. Indeed, sometimes they listened, and sometime they got all het up about it. Yet the institutions of science held firm. Before the IPCC there had been other politicised scientific institutions – the USA EPA is the prime example (see discussion here). And as for the Hockey Stick, well, by then it was all over, with the Climategate emails confirming that a culture of science-as-advocacy was already endemic in the science informing the IPCC assessments. The travesties of the Third Assessment would be unimaginable without the transformation that had already occurred in the writing of the Second Assessment. Madrid was the tipping point, when everything began to change. Not that everyone noticed it at the time. That the general shift begun at Madrid is much easier to see now with so many years of hindsight. Under *Detection and Attribution* mention is made of Hansen’88 as an early point in this mess. In what I write below Madrid’95 would be on the steep upward slope. I wonder if *scare/scams* have some smooth distribution, such as a normal distribution. One would have to select the metric, perhaps money, volunteer activists, newspaper headlines, or some combination of things. Lots of problems with this, I know. Note that one possible date for the beginning of CAGW might be 1988 with James Hansen’s testimony on climate change to congressional committees that brought public awareness to the issue. Perhaps the “hoopla” peaked at 20 years (5 years ago) and will sink beneath our notice 20 years after peak. We have 15 years to go but should now be in the rapid decline stage. As this CAGW scam sinks beneath the froth something else will be ascending. I don’t think sustainability has the Roman Candle awe needed to (excuse the pun) sustain a scare/scam. Suggestions? From what I see in this post, I think it is verr probable that the Madrid meeting was the tipping point into the great abyss that climate science has fallen into. At this point i see no way for climate science to pull itself out of this mess. Let us hope that some in the community have some very strong pitons and climbing rope to claw our way back into the light. How did he get away with making these changes? I mean really….how? How come nobody made a huge protest? Was the trough that inviting that nobody wanted to rock the boat? This is the story of very sleazy goings-on, trying to ‘slip one through’. They succeeded in getting away with it for 14 years. And, apparently, they still have. Superb post. The other posts there are excellent, too. I particularly enjoyed Civilisation and Climate, whose thesis is that the fatalists and the redeemers have been taking turns dominating the field for centuries. Note the observation that WG 1, 2, & 3 were working in parallel, instead of in sequence. That has always told me that The Fix Was In. Extremist left-wing infiltration would not have helped but at least climate science tried to keep on track… for a time. IMHO, the “tipping point” came just before the formation of the IPCC. Santer’s thesis was supervised by Tom Wigley who took over as Director of CRU from Hubert Lamb. Ironically, as I recall the thesis demonstrated the inability of top climate models of the time to reproduce the major semi-permanent major pressure systems of the North Atlantic, and they produced a massive pressure system that doesn’t exist. I also recall the North Atlantic was chosen because it was the region with the best weather records. The failures of the models confirmed Lamb’s argument that the data was inadequate as the basis for climate models. I know when I talked with him at length about the role of computers in climate science that he saw them as useful for data storage and basic statistical analysis, but believed that without the data there was nothing on which to construct models. When you read the leaked emails, Wigley emerges as the eminence gris to whom all his old pupils and colleagues at CRU turn to for advice and direction. It is not surprising Santer was pulled from relative obscurity as a student of Wigley’s and promoted to lead author of Chapter 8 of the 1995 IPCC Report. including the diagram of the cherry-picked graph produced at the time on the late John Daly’s wonderful web site “Still waiting for Greenhouse”. Anthony has provided much more detail above, but I will add three points. 1. It was the first time the PR recovery process went into action with personal attacks on Seitz and Singer and rejoinders in the New York Times. Some of us knew what was going on, but the PR counterattack worked as it has many times since. 2. The comparison of global warming skeptics and later climate change deniers to those who denied tobacco caused cancer is still in use, even though most don’t understand the broader reference. It has become a standard for climate science ignorance, blindness and corruption. 3. I recall Santer being one of the first exposed CRU/IPCC people to play the victim card saying that he was on the verge of a nervous breakdown over the nasty an unwarranted attacks. Unbelieveable and necessary. This is great background foundation for all to understand. Infinite thanks John, and Anthony. The scope of this challenge is increasingly epic, and I’m afraid an unending contest between nirvanic fantasy and tumultuous realism. It’s going to take all we’ve got to confront others fantasies – forever. After all, will the susceptible ever stop fantasizing about nirvana while attempting to force their fantasy upon others prior to knowing and accommodating the facts? I’m very much looking forward to your insights in the next post. There was no evidence of exceptional or even appreciable warming when Hansen made this sworn testimony. The post-WW2 warming 1948 – 1988, even using his corrupted record, was about 0.2 C only half the warming 1900 – 1940 of about 0.4 C when human CO2 emissions were trifling by comparison. Archimedes had his legendary ‘eureka’ moment and rushed down the street naked; modern astronomy when Galileo turned his telescope on the heavens, chemistry when Lavoisier did his combustion experiments, general relativity when Eddington photographed the solar eclipse in 1919 and IPCC science when Ben Santer blue-pencilled the unexpurgated SAR. That’s the moment when CAGW became “settled science”, unquestionable, indisputable, self-evident and undeniable. I think you are mistaken to think this can ever be nailed down to a date or event. I have recently been studying archaeology. In archaeology there was a massive and similar change. In the 1960s ‘New Archaeologists’ such as Lewis Binford, asserted that archaeological interpretations could, if the scientific method was applied, come to completely objective conclusions.Hence the term “experimental archaeology” … a term which is now completely detached from its scientific roots. In the 1970s there was a reaction to this processual or “evidence” based archaeology called post-processual archaeology, which is sometimes alternately referred to as the interpretative archaeologies by its adherents is a movement in archaeological theory that emphasizes the subjectivity of archaeological interpretations The post-processual movement originated in the United Kingdom during the late 1970s and early 1980s, influenced by French Marxist anthropology, postmodernism and similar trends in sociocultural anthropology. Here, in this almost completely different subject, we have almost the same movement away from evidence, away from hard science, and to expert opinion, interpretation, subjectivity. In archaeology this movement developed because people could see that there were associations and links in the landscape – that monuments from vast time periods cluster in particular places which clearly had a profound meaning to those involved, but which could not be expressed through the narrow confines of hard evidence. In science, the rules of evidence and verification by experiment were relaxed because in subjects like the environment, medicine and global climate,. it was not possible to do experimentation on the subject, so alternative ways had to be found to draw scientific inference without the opportunity to be scientifically rigorous. There are good reasons the post-modernist movement developed in a whole range of subjects. There is no doubt in my mind that the pendulum has now swung so far out of kilter that there will be a backlash against this interpretative “non-science” … which to be fair happened some time ago in archaeology with the post-post-processual movements. We sceptics are indeed part of the post-post-modernist movement in science. We are attempting to bring science back to scientific rigour and assertions based firstly on evidence and only if necessary (and where clearly flagged) on opinion. The real problem is that the post-modern movement occurred just at the wrong time, allowing the new area of climate science to be populated by extremist post-modernists who have been rather successful in holding back the post-post-modernist movement to which other academic disciplines have been subjected. But it will come … the subject may be isolated and bunkered down to “resist invaders”, but they cannot hold out forever. I disagree on the date. You could reasonably argue that the Rio event in 1992(I think) where the deliberate distortions between the major report and the summary for policymakers was the “tipping point”. It was for me anyway. Not sure that 1995 is all that important. EPA was on the case long before that. Hansen wasn’t a revolutionary outlier in 1988; he was simply reflecting the “settled science” as already determined by the grant-givers at EPA. Thanks for refs to the work I did, Berniel! * a convention in Switzerland IIRC, all the familiar faces there. Also Rio. * yes, the unfortunate appointment of Wigley. Also Bert Bolin in Sweden. * Houghton is a Christian and is still being touted in Christian circles. * the early work of John Daly, Willie Soon and Sallie Baliunas – all of which still deserves defence against vicious slander. * the work of Tim Ball who saw the corruption right from the start and stood up to it right from the start – for which he was meted the worst punishment possible at Wikipedia – deletion. Thanks to a friendly prompt I’ve quietly reinstated Tim Ball’s bio at Wikipedia. You can now edit it further if you wish. I’ve saved it as a text file so even WMC cannot destroy it again. Intend to reformat it for the Climate Skeptics wiki I’ve been working on in patches. * Richard Lindzen’s essay showing the modus operandi of the infiltration of bona fide scientific organizations by activist mobsters. * a revealing exchange between the horrible Bob Ward who was PR at the Royal Society and Martin Durkin. So important that an accurate history of this pre-meditated crime be written for future generations to understand how science and many scientists became a weapon of mass deception to effect the biggest mass theft of wealth and sovereign power from the peoples of the former ‘western’ democracies. Important to chronicle who the key actors were. Also, worth emphasising that the general elections in the US and the UK in 1996 were important in linking the Madrid Conference in 1995 with Kyoto in 1997. In 1995, Clinton was looking increasingly likely to get a second term and in the UK, the socialist ‘New Labour’ Govt under Blair was a certainty after 17 years of conservatism. The fix was in by 1972. By 1965 the Milankovitch cycles were known and starting to be confirmed by hard evidence. The 88-year Giessenburg cycle was also known so cyclical warming and cooling over the short term could be predicted. The EPA had been formed and the NGO’s were forming such as Greenpeace and Sierra Club so the army of “Useful Idiots” was ready and waiting. The trial balloons, freon and the ozone hole followed by the Ice Age scare had succeeded quite nicely. All of this was the build-up to the big one, CO2 and global warming which allowed taxing and controlling human productivity by an international body. I have to admit I had not realised the depth of deceit practiced by certain individuals in the IPCC. I think we all recognise – alarmists excepted – the climate change industry is hugely corrupted by the demands of its political masters, requiring additional tax revenues. The climate change industry is: i) hugely expensive, ii) based on fallacy, data manipulation and disinformation, and iii) addicted to self-preservation and growth, in similar fashion to a cancerous tumour. This was an excellent article and I look forward to the follow ups. I confidently anticipate it will generate a lot of self-righteous screeching from the CAGW faithful. What the bloody hell is an “accidental” warming? Oh, I beg your pardon, I accidentally bumped the global thermostat! or Oh. so sorry, I left the blowdryer running and apparently heated the entire freaking planet. Enron was the tipping point. Once they figured out the notion of “carbon exchanges” and that there could be billions of dollars to be made, the rest was easy. Sadly it does not need extreme left-wingers to be invloved anywhere, although those will be the ones out in the streets throwing bricks, bottles, stones, or whatever around the world in AGW protests, shouting about how this industry or that business has “destroyed” something natural or somesuch on the flimsiest of evidence. Their job is to sow seeds of doubt & confusion! The bulk of the people involved are fairly moderately left-wing but they have that grand left-wing agenda, a global guvment, that will dictate to everyone, except themselves of course, how we should live our lives, with ever more ridiculous claims about the causes of AGW, Cancer, any illness infact of any illeffect on anything! That’s how Guvments of all sizes generally work, they need the people scared, the people then look to the guvment for salvation & protection. Unfortunately this generally relies on the people being too stupid to ask questions. Hence the need for Agenda 21 to dumb-down science, & de-educate the people, break up the family unit, train the children to look to the mighty state for information on anything & everything, not their parents! They promise lots of good things will happen if you follow their rules, yet they will limit education to hte youth of the future by this approach, they consume less if poorly educated, or so they believe! It’s what they will destroy in their efforts to achieve their agendum that worries me! This is Bernie Lewin’s work, Your appreciation should be expressed to him (with minor kudos to Anthony for cross-posting it). Reply to E M Smith’s comment above: on my blog site to which I referred earlier, the Hartmut Bachmann book from which I quoted gives the whole gestation history of the IPCC from 1969 onward. Alas, it’s in German – but an English translation is sorely needed. Can do if a publisher were found. (years ago I translated two of Buckminster Fuller’s books – trickier to translate than most – into German and arranged their publication). Would love to see a copy of the letter Day Olin Mount sent to Houghton. Maybe a FOIA request to the State Department? It is a sad truism though that in “Political Science” it is only the scientists who get damaged when the politicians decide to move on. The fact that Hansen accurately predicted the course of anthropogenic global warming around 1980, before there was any sign of it in the temperature series, makes his work doubly impressive. Also of course, there was no reason to wait for unequivocal detection of greenhouse warming before implementing emissions reductions agreements, since the major anthropogenic changes to the Earth’s atmosphere were already unequivocal, and that was sufficient to warrant action. For me, that key event occurred with the Brundtland commission on sustainable development. It was the first document to give inter-governmental credence to the the notion of the Precautionary Principle. It is the acceptance of this principle as a basis for science that has opened the gate for all that came after. In science there are always things that cannot be quantified sufficiently well to come to firm conclusions. However, the Precautionary Principle drives us to come to conclusions anyway. Until this principle is struck down, the perversion of science for political goals will continue. Hansen was wildly off the mark in his failed predictions. That fact alone is sufficient to hold off on any ‘action’. We are overtaxed already, and listening to climate charlatans like Hansen would only make matters worse. One of the tricky things for the scientific method is designing meaningful experiments in systems of high complexity. I remember learning from the Feynman Lectures on Physics just how hard it is to solve partial differential equations in all but the most trivial of real situations. It is why engineers value rules of thumb as well as scientific exactitude, since they know that exactitude is achievable so rarely in real situations. In climatology, it appears to me that the political sphere has intervened long before the basic scientific understanding has been completed. The science is still at the stage of identifying component actors of influence as well as starting to understand how their joint influence can affect system dynamics. Politicians have been ill-educated despite wishing to allocate billions of funds, which has caused the distortions in scientific activity off the back of hyped claims. One hopes that the current generation of politicians are being better educated….. Whether you can imprison any scientists for ’embezzlement of Government funds’ is a moot point: it would do climatology a great deal of good if it WERE possible. 1995 was the start of the great bull market of the warmers which peaked about seven years ago. It will not return again soon……..
Perhaps you could run another article if you feel that a seminal meeting took place which decisively turned the tide back toward skeptical enquiry……..? Houghton is a Christian and is still being touted in Christian circles. We don’t all blindly believe the rantings of a delusional Archbishop of Cantabury who is a well known anti-nulcear, anti science, anti-capitalist lefty!!!! His history is riddled with it! He all but openly admits it. AND I think Jesus Christ would have something to say about the tactics employed of equally well known anti-science alleged Christian, one Jo Abbess, she of blackmail fame on the international scene intending to victimise Roger Harrabin for non-conformism on AGW a couple of years back on the announcement of the WMO! Charming, quite charming, if she’s a Christian, I’ a rocket scientist! Things sure have changed since I was brought up under the Christian banner. I think Icarus62 was probably being sarcastic, as the later part of the post is clearly circular reasoning. Revisions to key report understate climate change uncertainties. change being prepared by the Intergovernmental Panel on Climate Change (IPCC). to The Energy Daily by the coalition. Perhaps most damning, the summary of the draft has been revised significantly. temperature to emissions from human activities remains problematic. IPCC process – crucial to any future policy directives – is at stake. “The IPCC now is faced with an embarrassing situation,” the coalition wrote. I have made no verifications. An interesting video. Watch it and make up your own mind. You may also want to read a history of the rise of eco-extremism, written by Patrick Moore, a co-founder of Greenpeace. As your Canadian next-door neighbour, I do not want America to fail. I want America to succeed and prosper. In my previous career, I did my bit to help. The CAGW scam is not, as many of us originally believed, the innocent errors of a close-knit team of highly dyslexic scientists. The evidence from the ClimateGate emails and many other sources, and the intransigence of these global warming fraudsters when faced with the overwhelming failures of their scientific predictions, suggests much darker motives. I am very impressed by range of superb responses – as some have said, we should record this history. If for no other reason than that there is a saying: “history is written by the victors”. By inference, if we write the history of global warming … we will be the victors! Obviously, this isn’t the normal inference. But let me put it this way, if we make sure that a truthful and honest history is available … it’s going to make it darn well impossible for the scamsters to have any credibility when they bring out their distorted version of “history”. By Richard S. Lindzen. Mr. Lindzen, a professor of meteorology at MIT, was a member of the National Academy of Sciences panel on climate change. As usual, far too much public attention was paid to the hastily prepared summary rather than to the body of the report. The summary began with a zinger — that greenhouse gases are accumulating in Earth’s atmosphere as a result of human activities, causing surface air temperatures and subsurface ocean temperatures to rise, etc., before following with the necessary qualifications. For example, the full text noted that 20 years was too short a period for estimating long-term trends, but the summary forgot to mention this. But — and I cannot stress this enough — we are not in a position to confidently attribute past climate change to carbon dioxide or to forecast what the climate will be in the future. That is to say, contrary to media impressions, agreement with the three basic statements tells us almost nothing relevant to policy discussions. One reason for this uncertainty is that, as the report states, the climate is always changing; change is the norm. Two centuries ago, much of the Northern Hemisphere was emerging from a little ice age. A millennium ago, during the Middle Ages, the same region was in a warm period. Thirty years ago, we were concerned with global cooling. Distinguishing the small recent changes in global mean temperature from the natural variability, which is unknown, is not a trivial task. All attempts so far make the assumption that existing computer climate models simulate natural variability, but I doubt that anyone really believes this assumption. What we do is know that a doubling of carbon dioxide by itself would produce only a modest temperature increase of one degree Celsius. Larger projected increases depend on “amplification” of the carbon dioxide by more important, but poorly modeled, greenhouse gases, clouds and water vapor. The press has frequently tied the existence of climate change to a need for Kyoto. The NAS panel did not address this question. My own view, consistent with the panel’s work, is that the Kyoto Protocol would not result in a substantial reduction in global warming. Given the difficulties in significantly limiting levels of atmospheric carbon dioxide, a more effective policy might well focus on other greenhouse substances whose potential for reducing global warming in a short time may be greater. climate scientists. Within the confines of professional courtesy, the NAS panel essentially concluded that the IPCC’s Summary for Policymakers does not provide suitable guidance for the U.S. government. The full IPCC report is an admirable description of research activities in climate science, but it is not specifically directed at policy. The Summary for Policymakers is, but it is also a very different document. It represents a consensus of government representatives (many of whom are also their nations’ Kyoto representatives), rather than of scientists. The resulting document has a strong tendency to disguise uncertainty, and conjures up some scary scenarios for which there is no evidence. Science, in the public arena, is commonly used as a source of authority with which to bludgeon political opponents and propagandize uninformed citizens. This is what has been done with both the reports of the IPCC and the NAS. It is a reprehensible practice that corrodes our ability to make rational decisions. A fairer view of the science will show that there is still a vast amount of uncertainty — far more than advocates of Kyoto would like to acknowledge — and that the NAS report has hardly ended the debate. Nor was it meant to. Thank you for the evidence laden ‘part 1’ of your article “Madrid 1995: Was this the Tipping Point in the Corruption of Climate Science?” I look forward to your ‘part 2’. Setting out the corruption of the IPCC’s climate science agenda is an important work. Santer does superficially appear as an unbelievably naive and simple useful tool at the hands of veteran ideologists/political operators that form the core of the problematic IPCC. He seems so unbelievably naïve that I do not think he was naïve at all but rather he was already a committed Post-Normal scientist (a la Jerome Revetz) because he let ideology/politics/pre-science influence the outcome of his scientific decision and efforts; just like a core of individuals involved in the IPCC who let their science decisions and products be informed by an already decided policy. Whenever I am accused of not being a climate scientist, I say I don’t have to be when the political agenda is spelled out, shamelessly and shamefully, in their own words. The fact that Hansen accurately predicted the course of anthropogenic global warming around 1980, before there was any sign of it in the temperature series, makes his work doubly impressive…. Oh BULL Patties. There was nothing magic about Hansen’s prediction it was all “Smoke and Mirror’s” to give CAGW legitimacy. Anyone paying attention to science at the time could have done the prediction just from reading the literature. Heck there were CONFERENCES on the subject. The Earth’s weather machine is an exquisitely complex affair, in which many processes are simultaneously at work. Clearly however .the weather system is principally driven by the sun (Roberts 1976)…. 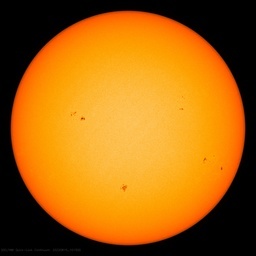 In 1853, Wolf also claimed that there is a 83-year sunspot cycle. This longer term variation becomes evident simply by smoothing the data. Wolf’s original discovery of an 83-year cycle was forgotten, but the long cycle was rediscovered by H.H. Tuner , W. Schmidt, H.H. Clayton and probably others. After W. Gleissberg also discovered this 80 to 90 year cycle around 1938, he published so much material on the subject that ever since, it was called Gleissberg cycle(Hoyt and Schatten 1997). Thanks John. That looks like the full text. chapter, Detection of Climate Change and Attribution of Causes, were given to The Energy Daily by the coalition. This seems to be suggesting that the pre-Madrid draft (9Oct95) was the one accepted in Rome (Dec95), and so the changes occured after Rome and before the GCC saw the final pre-print in May 96. Others have said that the draft Chapters approved at Madrid was the pre-Madrid (9 Oct) draft, but the one submitted by Houghton and accepted at Rome was the new draft as published in June 96. This is the way it is often told by the defence. Over the years I have heard both stories and wondered which is true. In fact neither are true. In fact it was much more messy than that. I have it on good authority that in each case there was no actual draft (no actual text) approved or accepted. How this happened, I hope to explain in a follow up posting a week or two out. …..In science there are always things that cannot be quantified sufficiently well to come to firm conclusions. However, the Precautionary Principle drives us to come to conclusions anyway. Until this principle is struck down, the perversion of science for political goals will continue. Oh it has been “Struck Down” but only when it is to the politicians advantage such as when you are talking about our food supply. This is when I stopped believing the USA government was “Here to protect me” The CAGW mess has done nothing to convince me otherwise. Icarus62 is a wandering ghost of unhealably warmist catastrophist proportions. He was not being sarcastic. Icarus, a scientist who uses a theory to make a prediction is just a scientist doing his job. If the prediction comes to pass, the theory is confirmed, if not it is rejected and maybe a modified version has to be made. Hansen, BTW, made multiple varying predictions over time, so it’s small wonder that one of them, I think the one that SkepSci boasts from 1981 or so, fits the current (GISS/Hansen-produced) global temperature average. When you’re in charge of producing the temperature product that you yourself predicted, I guess that’s pretty easy. All later predictions from him are wildly off the mark in the warm direction. michael hart (April 23, 2012 at 5:51 am) suggests that this statement was satirical, but I fear it was not, being all too typical of the roughshod faux reasoning of the Warmist cult: The Earth seemed to be warming slightly after the cold ’70s, and atmospheric CO2 was rising. All you had to do was assume that the CO2 rise was anthropogenic (an assumption accepted even by skeptics that I doubt has ever been really substantiated), and assume that CO2 caused the warming (no evidence needed; it was “basic physics”), and—voila!—you had “major anthropogenic changes to the Earth’s atmosphere [that] were already unequivocal”—”no reason to wait” for them. That claim was all the Warmists needed to snooker the lay politicians, bureaucrats, academics, media, and even many scientists into accepting the “unequivocal” Argument from Authority, the authority being the newly-risen and self-appointed priesthood of ‘Climate Scientists’. It is wonderful to re-read the lonely op-ed from Richard Lindzen (posted by Allan MacRae above, April 23, 2012 at 7:04 am) back in 2001, objecting to the use of “Science, in the public arena, [which] is commonly used as a source of authority with which to bludgeon political opponents and propagandize uninformed citizens.” The Kyoto Protocol was a direct result of that bludgeoning by activists masquerading as scientists, who created the IPCC as cover for a radical agenda, and brainwashed an entire generation.
. . . The “wait and see” approach—let’s see how bad it gets—may seem rational, but in fact it is incredibly risky. There’s a time lag between what we do and what we see in our climate and weather. By the time we’re really seeing the full impact of global warming, it is too late to fix it. It is so much cheaper, and safer, to take steps in advance of catastrophe. Fix the problem upfront. Two thousand and eleven set the record for the most billion-dollar weather disasters—14 of them, in one year. We can’t afford these problems. Dogs howl out from dark alleys. More history – I just found this Lindzen article from 1997 – I don’t recall seeing it before. I wrote similar words in 2002 and 2003, but not as elegantly as Lindzen, or as presciently. Forty years ago, when weather modification was popular speculation in meteorology, the Soviet Union realized that climate was always changing while our ability to modify it was minimal at best. It, therefore, reached an agreement with the US never to use climate modification as a tool of war, thus preventing people from mistaking the inevitable droughts, floods, heat waves and cold spells for acts of war. The agreement displayed an unusual and admirable appreciation for nature and concern for mankind. The graceless machinations at Kyoto over the past 10 days have illustrated how far both have deteriorated since. The negotiations present an unseemly picture of diplomats desperate for some treaty at any cost, industrial interests asking that any treaty, however bad, be applied to the developing world, and environmental advocates insisting dishonestly and absurdly that all scientists agree with the most lurid scenarios. The last follows an ignominious tendency of the 20th century to invoke the perceived authority of science in behalf of policy, however evil. In the case of global climate change, there was a blatant attempt to coopt the science through the establishment of a politically led international panel, the Intergovernmental Panel on Climate Change (IPCC), allegedly ‘representing’ science. The present head of the IPCC is currently at the World Bank. He has never contributed to our understanding of the physics of climate, but has publicly declared that binding emissions restrictions are essential. Given the potentially immense costs to all, and the suspicions (not totally unfounded) of the developing world that environmentalism will be the disguise of imperialism in the 21st century, it was not surprising that the negotiations were contentious. In many ways, the science was irrelevant to the outcome. However, it is worth remembering that even the IPCC could not hide the immense uncertainties concerning such an elementary process as the greenhouse effect. Nor could it ignore the substantial evidence that current primitive models are exaggerating the effect of emissions on such a basic quantity as global mean temperature. Claims concerning storms, floods, droughts, disease, climate ‘surprises’ (whatever they may be) are so speculative that we do not know if emissions controls are likely to help or harm. In point of fact, we do know that the emission controls, arrived at in Kyoto, however costly, and even if globally implemented, would have little real effect on climate no matter what one believes. The point is that emissions levels are different from atmospheric levels. The atmosphere will continue to accumulate carbon dioxide for many years to come, and its influence on the climate, though small, will continue to rise. According to present models, only global emission reductions of about 60% will stabilize atmospheric levels (though these models are questionable). Clearly, if one is truly concerned about global climate change, one will have to be prepared to adapt. Whether huge international regulatory regimes will improve adaptability seems dubious. Since we propose to give ourselves 12 years to act, let’s close the negotiations. Let us, instead, use the resources thus released to encourage science to really ascertain whether there is a problem or not, while sparing ourselves the spectacle of more Kyoto’s. And let us develop a more prosperous world where there will be sufficient food for all, where diseases like malaria are brought under control, where real pollutants are adequately reduced in air and water, and where the talents of all can be released to deal with the inevitable but unanticipated problems we will actually face. Among these may be a climate that will warm or cool regardless of the presence of human beings. The author is the Alfred P. Sloan Professor of Meteorology at the Massachusetts Institute of Technology, and a member of the US National Academy of Science. Since we propose to give ourselves 12 years to act, let’s close the negotiations. Let us, instead, use the resources thus released to encourage science to really ascertain whether there is a problem or not, while sparing ourselves the spectacle of more Kyotos. And let us develop a more prosperous world where there will be sufficient food for all, where diseases like malaria are brought under control, where real pollutants are adequately reduced in air and water, and where the talents of all can be released to deal with the inevitable but unanticipated problems we will actually face. Among these may be a climate that will warm or cool regardless of the presence of human beings. …. The Earth seemed to be warming slightly after the cold ’70s, and atmospheric CO2 was rising. All you had to do was assume that the CO2 rise was anthropogenic (an assumption accepted even by skeptics that I doubt has ever been really substantiated)…. You forgot the other Warmist assumption. CO2 is “well mixed” in the atmosphere. That is a key assumption that allows everything else to follow. It is an assumption that is “defended till death” even here on WUWT. This is the assumption that allows the questionable Ice Core CO2 measurements to be taken as gospel instead of Stomata data. It allows Beck’s study of ALL the historical CO2 measurements to be tossed out and Callendar’s handpick points from that same body of data to be used instead. It allows Mauna Loa Observatory to toss out data they do not like. All of this allows “messy” real world data gathered from several sources to be formed into a CO2 “Hockey Stick” for public consumption. 4. In keeping with the requirement that CO2 in background air should be steady, we apply a general “outlier rejection” step, in which we fit a curve to the preliminary daily means for each day calculated from the hours surviving step 1 and 2, and not including times with upslope winds. All hourly averages that are further than two standard deviations, calculated for every day, away from the fitted curve (“outliers”) are rejected. This step is iterated until no more rejections occur…. As a chemist who worked in batch and continuous mixing, CO2 is “well mixed” in the atmosphere is an assumption I just can not swallow especially when plants can change the amount of CO2 within minutes and you have active volcanoes adding CO2 day in and day out. Thanks for digging up the Lindzen articles. What a gem he is. Unfortunately I believe he will retire in the not too distant future. While I would wish him a well earned retirement, a telling issue may be the orientation of whoever replaces him at MIT. You forgot the other Warmist assumption. CO2 is “well mixed” in the atmosphere. That is a key assumption that allows everything else to follow. It is an assumption that is “defended till death” even here on WUWT. . . Yes, there are other assumptions built into the Warmist claim of CAGW, besides the two I mentioned (that recent CO2 rise is anthropogenic, and that more CO2 heats the planet significantly), but these two are all they needed to con the public into believing that ‘global warming’ was real and urgent. You are right that the ‘well-mixed’ assumption underlies the CAGW claim, as does the assumption that ‘global mean temperature’ is a meaningful (and measurable) physical quantity. But they are arcane enough that it takes a certain level of skepticism even to raise them, and of course such skepticism is the last thing the Warmists want to encourage in the public at large. The above post, along with other documents, will become required reading for future historians as they examine the failure of the biggest heist / scam / con job ever perpetrated on the human race. –This is a good point. There has to be soem vague, general idea that the populace will hold, then there needs to be some serious agent of change. Here, it was the prospect of making money. Enron, the UN, etc., saw the dollar signs, and so pushed and otherwise supported the global warming idea. It was a couple years later when the DOE funded Michael Mann’s dissertation that yielded the hockey stick graph. I just heard Van Jone on NPR this month. He has insightful analysis on how society changes – his focus is not on the commercial world but on the policy world. He has observed that Obama was elected with great expectations about “progress,” but he and the rest of the “progressives” have been disappointed. Jones has analyzed why this has not materialized, why the conservative side has had things happen, and what the ‘progressives” need to do. Jones says there needs to be two simultaneous trends: “grass-roots,” in the streets activism, such as tea party had, and policy/elected officials. The populace makes it politically feasible to forward certain policy efforts, and puts those on the agenda. The policy side is the actual change, which cannot happen simply by many people having an opinion. The message, as McLuhan had noted, is more improtant than the reality. This NPR interview was shocking to me. In it, Amy Goodman played audio of Glen Beck noting the truth, which is that Jones is a self-avowed marxist. There was no question. The audio clip was clear, and Jones is on record as much. Jones and Goodman avoided the marxism issue and painted the issue of a socail-movements issue, and switched the topic to tear party strategies versus progressive strategies for change. Here was a clear example of the “progressive” strategy” never mind the truth; their virtuous agenda over-rides the need for truth / for analysis of actual data. I was shocked at their boldness. Actually playing a Beck quote, then laughing it off, and focusing instead on what the “left’s” message needs to be, and where it will come from. Nowadays, many of these isues will be financed by “the one percent,” rather than by cap-and-trade schemes. Taxes will be the powerful mechanism, while somehow street level activism will create the public sentiment and public willpower. This post starts with the story of Santer making an unlikely jump to a leading role in IPCC 2. Michael Mann made an even more unlikely jump to have key roles in IPCC3. He graduated/finsihed hockey stick dissertation in 1998, and jumped right to the next ipcc report, that came out in 2001. That is an unlikely jump. –At the same time, in his recent book abt dispatches, Mann has tried to portray the post-diss events differently – he has tried to say this hockey stick was just some little aspect of his dissertation, and it took on a life of its own, bringing him all the negative attention. If he was not so focused on this, he did not have to promote the issue and the hockey stick via his role in IPCC3. He should never have death threats and other such problems, and I don’t think it is right to make fun of his bald spot and dopey things like that that people make fun of. But he certainly deserves negative attention for helping promote an unfounded scare. Enron seemed to have egged on the Global Warming Industry quite a bit. Enron, joined by BP, invented the global warming industry. I know because I was in the room. This was during my storied three-week or so stint as Director of Federal Government Relations for Enron in the spring of 1997, back when Enron was everyone’s darling in Washington. It proved to be an eye-opening experience…………………………….. The basic truth is that Enron, joined by other “rent-seeking” industries — making one’s fortune from policy favors from buddies in government, the cultivation of whom was a key business strategy — cobbled their business plan around “global warming.” Enron bought, on the cheap of course, the world’s largest windmill company (now GE Wind) and the world’s second-largest solar panel interest (now BP) to join Enron’s natural gas pipeline network, which was the second largest in the world. The former two can only make money under a system of massive mandates and subsidies (and taxes to pay for them); the latter would prosper spectacularly if the war on coal succeeded. The AGW scare seems to have been encouraged by big fossil as they saw huge profits. No wonder they fund CRU, the Stanford Climate Unit and other Warmist rent seekers to the tune of tens of millions. In1995. There is something eerily ironic and possibly organic about such seminal pronouncements of alarmist conclusions. I’ll let Dr. Phil Jones tell it: “… that for the past 15 years there has been no ‘statistically significant’ warming (stated in February 2010). This would place the beginning of the ‘no statistical warming’ period at 1995, just about the time they were cooking the IPCC Chapter 8. And of course we all enjoy the “Al Gore Effect” (http://www.urbandictionary.com/define.php?term=gore+effect) where everytime he went to talk about global warming, a snowstorm or at least freezing weather ensued. Well.., I think an important turning point was whenever they devised a new fictional fisics and began introducing it into the education system – I don’t know when these happened. The comic cartoon energy budget promoted by CAGW/AGW both is not a physical description of properties and processes of our real world Earth, but is now considered standard consensus physics – regardless that it has no Water Cycle, regardless that its molecules are ideal gas look alikes without volume, weight or attraction, therefore not subject to gravity, so the supermolecule AGW carbon dioxide can stay up in its atmosphere accumulating for hundreds and even thousands of years in its empty space atmosphere greenhouse based on ideal gas in a container.., and therefore, in this imaginary AGW world through the looking glass with Alice, there is no need for convection and so radiation can rule supreme and the second law can be junked; and, to top it all, where visible light heats land and oceans, (a physical impossibility in the real world), and, where it is claimed the direct heat from the Sun, which is thermal infrared, doesn’t reach the Earth’s surface and so plays no part in heating it. Whoever tweaked real physics to produce this fictional world, to create this strangely clever pastiche, must be laughing his socks off at all the arguments defending it..
–another example where promotion of the correct progressive thinking has nothnig to do with facts, but emotions. the man says it himself – don’t argue facts. find commonalities, and build on that. uh, no. how abt we look at whether temps rise as CO2 rises. @Allan MacRae Thanks for digging up the Lindzen articles. What a gem he is. Unfortunately I believe he will retire in the not too distant future. While I would wish him a well-earned retirement, a telling issue may be the orientation of whoever replaces him at MIT. My pleasure Brent. I hope Lindzen will continue post-retirement in a suitable role where he can continue to speak and write the truth, in his succinct and elegant style. I know two excellent climate scientists who have left their universities because they refused to be intimidated by the brown-shirts of global warming hysteria. Lindzen has remained at MIT, defiant and outspoken, despite all the false criticism, slander and libel from global warming alarmists and acolytes of the CAGW “Cause”. I greatly admire Richard Lindzen for his intellectual rigor, his stoicism, and his courage in the face of this vicious onslaught. Moderator, I apologize for the post above at 9:26am where the article “Reflections on Kyoto” is duplicated – if you can delete the LOWER HALF of this post where the duplicated article re-commences, that would be sincerely appreciated. Thank you. You know what still burns the left up more than anything else about this? and George Bush was right!!! and George Bush was right!!!…. So Strong gave political contributions (of dubious legality) to both parties; George Bush, now a friend, intervened to help him stay in charge of the Rio conference; he was thereby enabled to set a deep green agenda there; and Bush took a political hit in an election year…. I find it curious that in this excellent exposé and the subsequent comments no mention has been made of the formative meetings that were held in Villach, Austria in 1980 and 1985. Houghton, Bolin, Annan and McBean were all there and – with the exception of Kofi Annan – it could have been a scientific planning meeting, but for the presence of that evil political genius Maurice Strong, whose boss Kofi was at the time. The result of it, shortly after the second meeting, was the establishment by the UNEP/FPCCC of the IPCC with its restrictive mandate of a human-caused global warming, with the exception of anything of wider exploration of the validity of such a cause. If that was not a scientific tipping point of disastrous consequences, I don’t know what was. I think that Ben Santer’s graph fiddling pales in comparison. Well.., I think an important turning point was whenever they devised a new fictional fisics and began introducing it into the education system…. A bit more on John Dewey and his political/university connections. The Webbs founded the Fabian Society and the London School of Economics where many of our political and economic leaders are educated. The permeation of the United States by British Fabian socialism proceeded primarily through the universities. The main root of Fabian “permeation” was Harvard University. Fabian socialists as well as Marxian socialists selected Harvard as the fount from which leftist ideology filtered through to other educational institutions. Later the communists borrowed from the socialists the formula of incubating revolutions through universities. (1) Among those who pioneered Fabianism in America (shortly after the formation of the Fabian Society in England in 1883) were James Harvey Robinson (Harvard, 1887), Oswald Garrison Villard (H’93), W.E.B. DuBois (H’90) and Harry Frederick Ward (H’98)….. The New School for Social Research, which operates as an accredited educational institution, has been sold to the general public as an independent and politically neutral institution. Actually the New School was cited as: “established by men who belong to the ranks of near-Bolshevik Intelligentsia, some of them being too radical in their views to remain on the faculty of Columbia University.”…. British Fabians such as Sir William Beveridge, J.M. Keynes, Graham Wallas, Julian Huxley, Bertrand Russell, J.B.S. Haldane and Harold Laski lectured at the New School for Social Research. The American counterparts of the British Fabians included such personages as: John Dewey, Clarence Darrow , Roger Baldwin, Felix Frankfurter, Franz Boas, Wesley C. Mitchell, Harry A. Overstreet, Max Ascoli and Walter Lippmann. Soviet partisans such as: Moissaye Olgin (later exposed as a top Soviet agent) also participated in the New School activities…..
* Policy reports commissioned from international experts. * Launched by a seminar at 10 Downing Street and followed by a series of working groups at the London School of Economics on the key policy areas: the New Welfare State; Public Service Renewal; Corporate Reform; 21st Century Citizenship; Science, Technology and Risk; Migration and Social Integration; and Global Governance…. It is actually a fairly small group who is steering this whole mess. I find it curious that in this excellent exposé and the subsequent comments no mention has been made of the formative meetings that were held in Villach, Austria in 1980 and 1985…..
And that is why WUWT and “Crowd Sourcing” is so effective. Great find BTW. I find it curious that in this excellent exposé and the subsequent comments no mention has been made of the formative meetings that were held in Villach, Austria in 1980 and 1985. I wrote the following paper in January 2008. It concluded that recent increases in atmospheric CO2 are primarily natural, not manmade. My primary evidence was that atmospheric CO2 lags temperature at all measured time scales. Furthermore, dCO2/dt varies almost contemporaneously with global temperature T. So T drives CO2, not the reverse. IF I am right, what does that say about the state of climate science? Seems to me it says we have to start all over again, almost from the beginning. Thinking some more about this opening question – I think yes, it was the actual tipping point. Recalling now that when I first began investigating the claims and though being shocked at the Hockey Stick saga as it was unfolding, the withholding of method, I was still enjoying the arguments, but then I also learned of this change and realised it wasn’t an argument about science at all. I was sadly disappointed, but from then more aware of the effect this was having on those scientists determined to show this was what was really happening. The attacks on them unconscionable. Whatever plans were made in conclave and shenanigans that went into creating the IPCC – it was this act of Santer’s which showed conclusively that this was the real agenda and this was how it would be promoted, and subsequent events confirmed corruption was the method to be used in overruling real science by those scientists supporting the agenda, or as we now know it’s called, the Cause. Thanks. My pastures are thirty 30′ X 300′ sections for controled grazing so I can perform all sorts of “experiments” to see what works best. You just can not kill that scientific training. John Hamaker when to the same school as I BTW.